Take A(n Irish) Hike, Lazy Elves! What do you do when the scarf you're knitting for your office's annual Yankee Swap isn't done in time? Easy, blame it on the elves! Due to the mediocre time management skills and general laziness of the elves assigned to knit this scarf for you, it is not quite finished. They have promised that if you give it to Shannon, she will see it is completed and returned to you in time for Christmas. 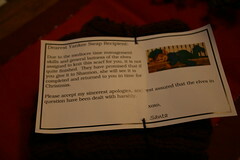 Please accept my sincerest apologies, and rest assured that the elves in question have been dealt with harshly. What you can't see in the too-dark picture is that the note is tied to a half-finished Irish Hiking Scarf knit in Wool Ease. I chose Chestnut Heather, a sort of coppery-red, in an attempt to make it pleasing to either gender without being black, brown or green. It ended up in the hands of a new employee who was attending her first ever company holiday party and, accordingly, had none of the alcohol-related expectations I discussed last year. Perfect! She gave it back to me at the end of the swap on Thursday night, and I took it home to finish up over the weekend. Jason was out most of the day on Saturday, and when he returned we suddenly had two Irish Hiking Scarves in the house. He'd given the nurse he works with a ride home that afternoon, and she'd left her scarf behind. 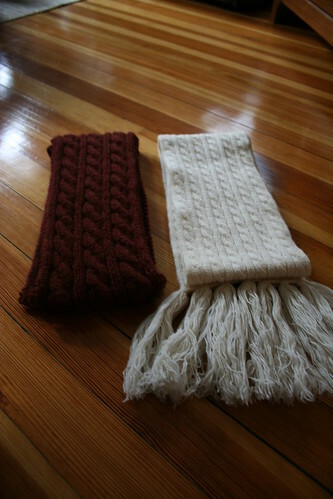 Though the picture is a bit blurry, her scarf (on the right) is a smaller-gauged version of the very scarf I'd just finished (on the left)! Failure to meet a deadline notwithstanding, I really enjoyed this pattern and can see why Irish Hiking Scarves are sweeping the knitting world this holiday season -- it's the old "knits-easy-but-looks-complicated" trick! The elves made up for last week's indolence by really powering through some Christmas knitting and finishing over the weekend. In just a few more days when the gifts are distributed, I'll be able to share pictures and details! On my current project, at the suggestion of the yarn-store-lady, I'm using a seed stitch. I can report that she was right, it really is a great reversible stitch. But for the love of the Knitting Goddess, is it the most boring thing I've ever done. I finished this about two weeks ago -- it's a scarf for Jason's dad. Seeing as the whole family is slavishly loyal to Columbia University, I thought that the patriarch should have a way to display his Columbia blues daily.